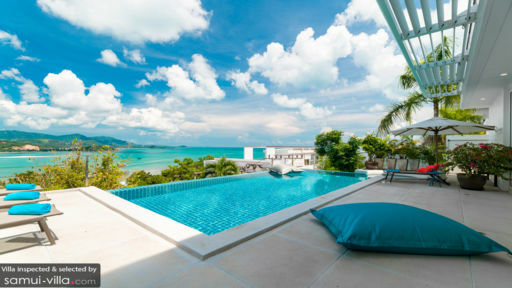 A two-storey oceanfront contemporary home situated in Bophut, Koh Samui, Sunshine Villa is a privately-owned villa with spectacular views of the turquoise waters of the ocean and a constant view of the changing skies. 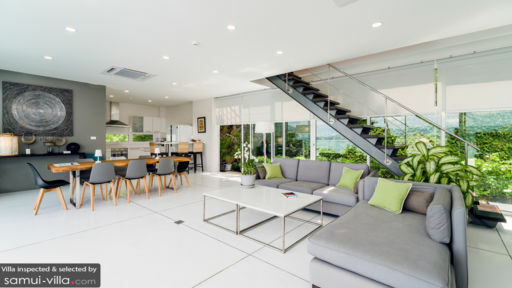 The modern home is elegant and classy with its pristine white interiors as well as exterior, a breath-taking 10-metre infinity swimming pool, sun deck for sunbathing and sunset views, as well as three bedrooms that open out towards the ocean! If you’re looking for utmost luxury and comfort, look no further than Sunset Villa with its modern amenities and state of the art living. Sunshine Villa accommodates three, air-conditioned bedrooms on the upper level with two bedrooms comprising king-sized beds and the third with twin beds. Each bedroom has glass doors that slide open to a private balcony; what greets you is the most beautiful and spectacular view of the ocean. The bedrooms are equipped to provide the most amount of comfort with minimal décor and ample amenities including fans, storage, and en-suite bathrooms. The master bathroom is fitted with a walk-in shower as well as a Jacuzzi! A panorama that consists of the mountains, lush greenery, clear-blue waters of the ocean, and the vast sky dappled with cotton candy clouds is what you get and much more at Sunshine villa. The outdoor space is dominated by a 10-metre infinity swimming pool that also connects to a Jacuzzi, for a relaxing water therapy session. There are numerous sun chairs found on the deck as well as bean bag loungers for you to relax on while enjoying the view. With an alfresco dining area setup on the deck, guests are free to relish a delicious local feast prepared by the chef upon request all the while taking in the mesmerising scenery. A swanky living space is found poolside with direct access to the swimming pool via glass doors that slide open to an awe-inspiring and jaw-dropping view. The blues of nature are contrasted with the sombre grey of the living room interiors for an amazing collaboration of the two. The sectional sofa is uber comfortable and so plush you’d never wish to get off it. A massive flat-screen is fitted for your enjoyment and towards the back the walls are entirely made of glass and give way to the most luscious array of tropical plants. The six-seater dining area is functional and comfortable, the ideal place for all guests to eat together and make merry. A door even leads to the garden on the veranda so you can take a walk and enjoy a cup of tea! The kitchen is modern and sleek with advanced technology fittings and appliances, all suited to serve your every need. The entire space is centrally air-conditioned to keep the tropical warmth at bay during hotter hours. Plenty of services and facilities are extended to guests at Sunshine Villa including housekeeping and management. There’s 24-hour security as well so you can rest easy without a worry in the world. If you wish, you can even enjoy a BBQ outdoors for some freshly-grilled food! 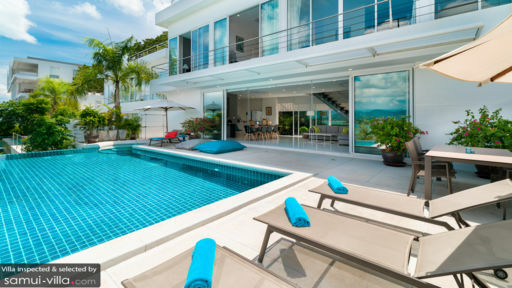 The villa ideally located in Bophut, only a few minutes from the Big Buddha and the beach. There is so much to do in this part of Samui as it is always bustling with travellers swimming, sunbathing, and exploring. You can even out at a local restaurant to try some exquisite Balinese dishes or take out a luxury yacht on the waters and enjoy the splendid view.